Colors play a massive role in establishing a brand identity for your business. You will be amazed by how colors can liven up the audience’s mood, attract their attention and at the same time, trigger a whole range of emotions. Jo Hansen, one of the clients we served, wanted to create a website for his Italian Food Restaurant. Although business was booming for Mr. Jo, he was still eager for further expansion. Therefore, he resolved to get his business an online website. A website was like killing two birds with one stone. With a website, his business will not only get a magnanimous digital exposure, but he will also have a creative presence on the Internet. Hence, he asked a third-party web design agency to build him a creative business website. The end-result rained over his parade. Jo Hansen wasn’t getting the exposure he desired. It happens to be that one of our enthusiastic web designers had a strong crave of Italian from his joint. And upon a simple over-the-counter discussion with Jo, he realized where things were turning a rot for the poor fellow. He explained to Jo where the problem was, and we scored a potential client for our business. Here’s a complete case study of how Branex helped redesign Che Bueno website from scratch. When designing different graphical aspects of your website design, it is advised that you keep thorough attention on hues, contrasts, and colours to make your site design as fascinating as possible. You need to make sure that you choose the right color palette to win your customer attention. And that’s what the entire science behind colors in website design is all about. 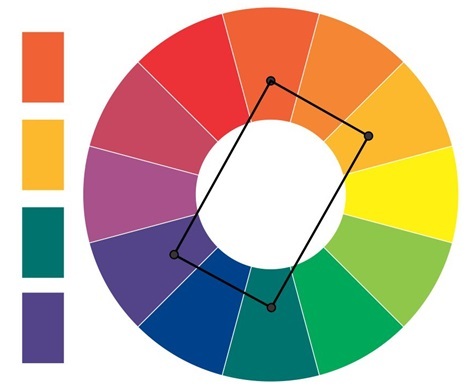 So, before you start making important decisions such as choosing which colors would look best for your website design, here is a detailed guide to give you a better comprehension of the science behind colors. Today, we will explore the basic color theories, how to establish a color harmony in your design, and the meaning behind different colors. So, without further Ado, let’s initiate our study on the science behind colors. When it comes to combining different colors for their website design, most website designers make use of the color wheel. Take a look at the color wheel closely, and you will realize that when you pick any color from the wheel and mix it with another, it will go beautiful together. The above diagram is a modern representation of the color wheel. Sir Isaac Newton created the prototype of the color wheel back in the year 1666. dWhile the original circle contained 12 colors based on the RYB color model. Over time, the wheel was revised countless times to meet the modern requirement of different businesses. 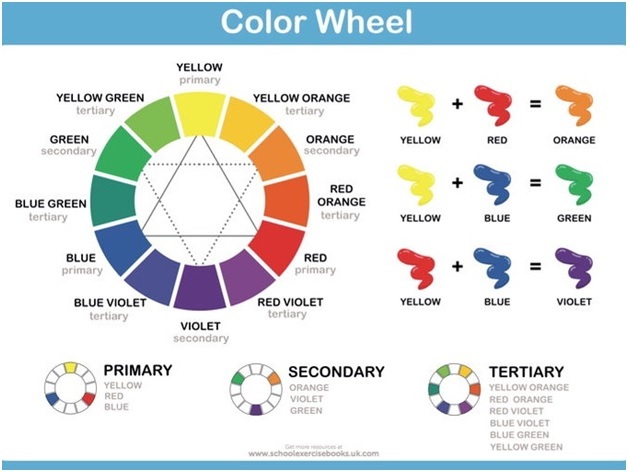 The above color wheel illustration shows three different color models categorized as the primary colors, secondary colors, and tertiary colors. 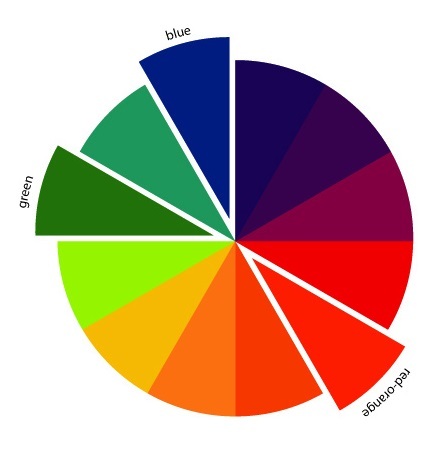 Here’s a different illustration of the color wheel which sheds light on the tone and shades of these colors. The illustration further shows which of these colors are warm and which are cool. What are Primary, Secondary and Tertiary Colors? According to the traditional colour theory, the primary color comprises of three basic colours; Red, Yellow and Blue. These colours can be mixed together to form any other color existing in the color wheel. It indicates that all other color combinations are an extract from the red, yellow and blue colour hues. Next up, are green, orange and purple colors. They are commonly known as secondary colors. These colors are formed by combining the primary colors only. After the secondary colors are the tertiary colors which are the by-products of combining primary colors with secondary colors. 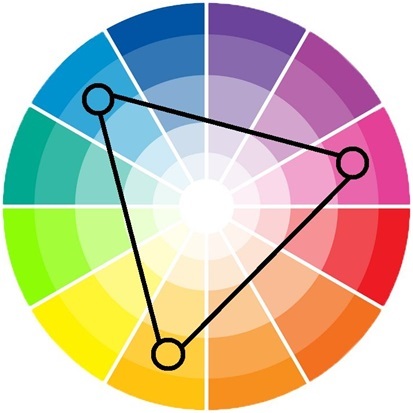 Other than the primary, secondary and tertiary classification of colors, according to the color wheel theory, the colors are classified into two other categories as cold and warm colors. If you check the above-mentioned illustrations, you will find that the colors are split into warm and cool colors. The warm colors comprise of red, yellow, orange and their respective hues. These are the natural colors which are most commonly found in heated elements such as the sun, fire, lava, etc. On the other hand, green, blue and violet epitomize calmness and serenity which make them cool colors. These colors are synonymous with cooler elements such as water, dusk, twilight, plants, etc. How to Create the Perfect Colour Harmony? I am sure you are now well aware of the color wheel and how different colors work together. Now, we are going to take a step forward and understand how to create color harmony using the color wheel. 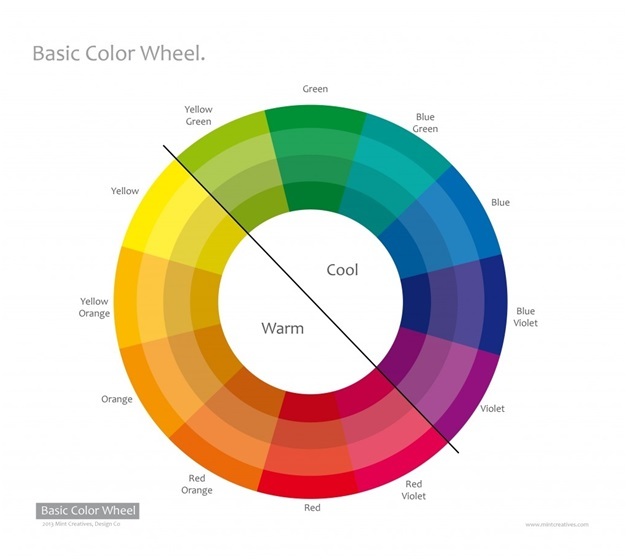 Why is it important to create a color harmony in your web design? Most website designs succumb to failure just because their colors don’t mix and match with each other seamlessly. Here are some interesting techniques that can help you create the perfect color harmony within your website design. The analogous color scheme utilizes colors which are adjacent to one another in the color wheel. 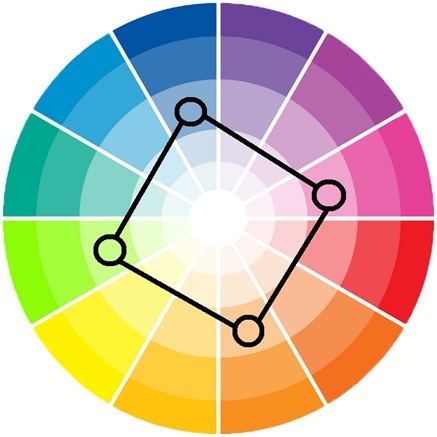 Since the color wheel is a circular classification of 12 colors, they are segmented into four quadrants. These colors typically combine with each other and create the most appealing schemes for your entire web design. The best thing about the analogous color scheme is that they are often found naturally in the environment. And well, if you look close enough, you will find them working in perfect harmony. 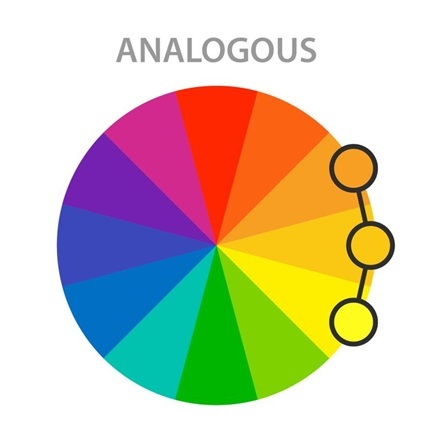 When using analogous color, you need to keep an important aspect in mind. Set the contrast in the right manner by using a dominant color as a primary, the second color as a support and the third as an accent. The Triadic colours are evenly spaced out in the colour wheel in such a manner as if you are looking at an equilateral triangle. The most interesting thing about the Triadic colours is how this particular combination creates the perfect vibrancy, even when they are matched with the paler hues of the colours. Similar to the analogous color scheme, you will have to establish the perfect harmony and balance between the three colors. You can choose one color as the dominant one, and the other two can be accents. 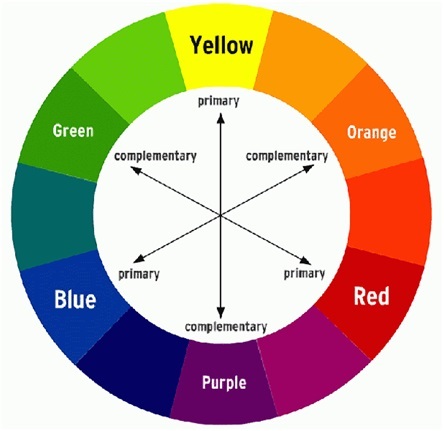 Colors which lie opposite to each other on the color wheel are complementary colors. For example, blue and yellow are complementary colors, as are red and green. Similarly, blue-violet and yellow-orange are also complementing each other. Why are complementary colors so highly favored? Because complementary colors have a very vibrant impact on the overall website design, however, it is essential that these color combinations get utilized in the right context. A website which offers chocolate will never fare well with red and green. Instead, a site running a chocolate business will favor purple and yellow. Just as much as the context is essential, deciding how you are planning to use the complementary colors is equally essential. For example, if you are using red as a predominant color in your overall web design, then make sure to use the green color in certain elements that you want to stand out in the whole website design. Here’s how the split complementary color scheme works! Take a base colour from the colour wheel, let’s say red-orange, and then split the complementing colour which is bluish green and pick the remaining two adjacent colours which are green and blue. This combination is an interesting one because it favors two different colours within the colour scheme then just one. This colour scheme works best for high contrast colour combinations. In case, you are a budding web designer testing colours, this scheme can work wonders for your web design samples. This scheme is favored because it hardly messes the design up. The rectangular colour scheme also known as the tetradic colour scheme favors four colours instead of three as discussed in the previous colour scheme. Designers often prefer to use the rectangle colour scheme by complementing two pair of colours. They use them in their web designs to create some enormously rich and beautiful colour combinations. As a result, the website and its elements stand out. When you are using the rectangle color scheme in your website design, you will have to pay close attention to the balance between the warm and cool colors within your entire website designs. Also, make sure that you use one color as a dominant color in your overall website design. Just like the rectangular color scheme, the square color scheme follows the same principle on the color wheel. But only this time, all the colors that you have picked out are evenly spaced around the color wheel. Similar to the rectangular color scheme, these four colors can build the perfect aesthetics for your website. You will have to choose one color as the dominant one, while the rest of these color scan be used to create harmony in your website design. Just make sure to keep an eye out for the warm and cool colors. The colour red denotes fire and passion. Hence, it is mostly associated with danger, strength, power and determination. While, that’s one side of the story for colour red, the other side is replete with lessons of desire and love. Red has a very emotional side; hence, designers believe that it has a very strong pov to capture the customer’s attention. Many websites use red in their CTAs while ours use it as a primary color. The color yellow epitomizes joy, happiness, and energy. It is also a strong indicator which ignites intellect. It also generates a positive and friendly feeling. It’s why sunny days are some of the best days in London. Since it is such a happy color, it often associates itself with children products or the leisure industry. While yellow exudes positive feeling, it is not a good color for websites of high-end goods industries. The color orange represents optimism and communication. While the color red is all about passion, a yellow color is all about happiness. And when both of these colors combine together, they create an invigorating effect on your site. Orange gives off a warm feeling to its customers and is the best colour for food or children based websites. That’s why Fanta uses orange colour as a motivator in audiences. The colour green is all about being natural. It is about balance and growth. It signifies harmony. It invokes solidarity and safety. It’s why green colours in traffic lights indicate GO! Due to its nature of providing stability, brands that are mostly eco-friendly can use green as a primary colour in their websites. Many people believe that Green is the colour of healing power and is also believed to improve vision. The color Blue instigates a sense of calmness and serenity. It is the color of the oceans and the skies. Blue invigorates the essence of conservatism, loyalty, and integrity. It’s one of the reasons why blue is the most favored color on the Internet. It has a soothing effect on both body and mind. It is the color of pureness and tranquility. It’s why most mineral water brands are using Blue as a powerful motivator. The Violet color mixes ice with fire. It brings the passion and fieriness of the color red and amalgamates it with the tranquility and peace of blue. It creates a true essence of royalty, luxury, nobility, and ambition. Violet brings wealth and prosperity to the table. It is the color of dusk and that’s what makes violet a color that exudes extravagance. Violet goes best with luxury brands and high-end goods. So, there you go; here’s everything that I have learned about using colors in website design. It defines the perfect psychology behind colors and how their combinations can work wonders for your website. While knowing about the combinations is one thing, their implementation is a completely different chapter. Here are some good examples of how to use colors in web design. I hope it has been an informative read. Until next time.